In light of the prospects in Guyana and the output of gold and precious minerals, the Ministry of Foreign Affairs has concluded discussions with a South African company for the setting up of a refinery here. 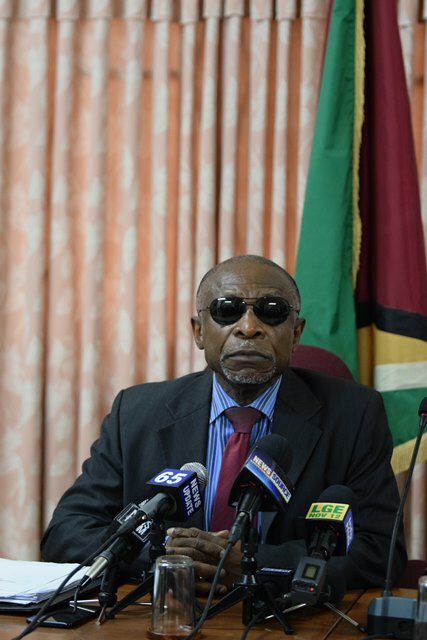 Minister of Foreign Affairs, Carl Greenidge made the disclosure while updating the media recently on the successes his ministry has had over the past three years. The company is presently awaiting information from the Ministry of Natural Resources and the Guyana Geology and Mines Commission (GGMC) to take the process forward, the minister related. He noted that the setting up of the refinery is just one example of the work being done and what can be achieved by the ministry. According to Minister Greenidge, the respective missions in India, Cuba and other territories have been able to forge partnerships that will see the export of products such as alcohol and other beverages produced by the Demerara Distillers Limited (DDL), rice and paddy. There have also been successes by the missions in Brussels, Panama and elsewhere in Latin America, the minister disclosed. Further, in response to a question posed by the media, Minister Greenidge reminded that the Ministry of Foreign Affairs is not an export agency. “What we do is engage our bilateral partners to modify the framework they may have, which may constitute barriers to us. We engage them at the policy level with a view to ensuring that if we have a product that we are interested in exporting, we look at the prospects and find where the problem that is arising is a lack of familiarity of their importers. We then try and put them together so that they can work on these matters and take it down the road,” Minister Greenidge explained. Trade negotiations, Minister Greenidge noted, are part of a long process, which involves pricing, seasons, shipment times and more.